18 Mar 2019 – A company partially owned by Erik Prince, a former Navy Seal who created the controversial private military company Blackwater, is now heading to Myanmar to protect Chinese construction projects there, according to reports. Frontier Services Group, one of Prince’s ventures, claims to be an Africa-focused security, aviation, and logistics company that provides support for Chinese investment projects in Africa as Beijing expands its global influence using big infrastructure projects. Now, the company appears to be expanding its reach into Southeast Asia, where Beijing is similarly gaining a foothold through its One Belt One Road development plan. The Myanmar Times, an English language publication in the country, noted that Frontier Services Group is currently recruiting new employees there. China is now planning to develop a multi-billion dollar port in Kyaukpyu, Myanmar, part of Western Myanmar’s Rakhine state. Hundreds of thousands of members of the Muslim ethnic minority the Rohingya have been forced to flee the Rakhine State over the past several years due to persecution and violence at the hands Myanmar’s powerful military. The predominantly Buddhist ethnic group ruling Myanmar has long viewed the Rohingya as illegal immigrants who do not deserve citizenship, despite the fact that they have lived in the country for centuries. Over the past two years, the military has accelerated its push to drive the Rohingya from Myanmar. Some human rights observers have labeled the military’s actions as ethnic cleansing. 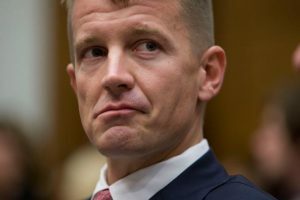 Prince is a controversial figure whose company Blackwater received widespread backlash after its employees opened fire on innocent Iraqis in 2007, killing 14. His questionable record in the Middle East was the subject of a recent interview with journalist Mehdi Hasan, who grilled Prince about previous statements he had made which appeared racist towards Iraqis. Prince also received backlash after it was revealed that Frontier Services Group was planning to build a training base in China’s Xinjiang Province, where Beijing has imprisoned over one million members of the Muslim Uighur ethnic group. The Uighurs are allegedly held in extrajudicial detention camps, forced to renounce their religion and subjected to re-education programs to make them more Chinese. It is unclear exactly what the Frontier Service Group training base would be used for, but the company reportedly signed an agreement in January to move forward with the project. The announcement about the training center disappeared from the company’s website, however, after it was reported on in the Western media. Prince denied that he knew anything about the training base’s construction. Despite the controversy, Prince has not shied away from promoting another controversial project: the privatization of foreign military activities in Afghanistan. Prince has spent years lobbying Trump administration officials on his plan to privatize the Afghan war. Prince is a close ally of President Donald Trump and is the brother of education secretary Betsy DeVos. He also recently became the subject of investigations into Russian interference in the 2016 elections after it was discovered that he met with Russian sovereign wealth fund manager Kiril Dmitriev in the Seychelles in January 2017. Some observers have questioned whether Prince was acting as a backchannel between the Trump campaign and the Russian government. Prince later told the House Intelligence Committee that he was not representing Trump, and that the meeting was just for business purposes. Cristina Maza is an award-winning journalist who has reported from countries such as Cambodia, Kyrgyzstan, India, Lithuania, Serbia, and Turkey. She previously worked as a reporter for the Phnom Penh Post in Cambodia, and as a reporting fellow covering energy and cybersecurity for the Christian Science Monitor in Washington D.C. She writes frequently about international affairs, politics, global development, religion, defense, and cybersecurity.